The ocean goddess who gives the Mermaid Princesses new songs and upgrades for their gear. However, this is all that she can do alone after expending a great deal of energy thousands of years ago. 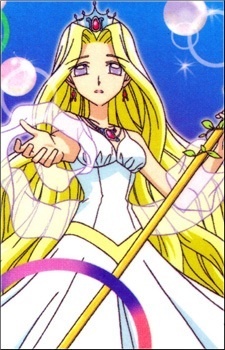 She is needed to ultimately stop the sea monsters, and the seven pearls have to be gathered to summon her; Gaito/Gakuto seeks to summon her as well, so that he can use her to destroy the world. Aqua Regina later gives bands to the mermaids to upgrade their singing power; as in many magical girl series, this is signified by adding frills and accessories to their dresses. She also upgrades their microphones in the end of season one, before she is finally summoned.